Cinematic Paradox: "One plus one equals two, right?" "One plus one equals two, right?" Starring: Lubna Azabal, Mélissa Désormeaux-Poulin, Maxim Gaudette, Rémy Girard, Abdelghafour Elaaziz, Allen Altman, Mohamed Majd, Nabil Sawalha, Baya Belal. If anything has changed about me this year, it's the fact that I have developed a better tolerance towards foreign films. No, that sounds awful - of the foreign films I saw back in the day I mostly liked, I'm not one of those people too lazy to read subtitles. This year, however, I have watched and absorbed many, and they're quickly becoming my favourite type of film. Such a reminder of that fact is the Canadian film Incendies, which was in contention for the foreign film Oscar earlier this year, losing to the Danish film In a Better World. Now, I haven't seen that movie, so this might be a bit presumptuous/wrong to say, but Incendies was far more deserving. Here is a film which I hope will live on as a classic in the future, as it is nothing short of an absolute masterpiece. Incendies embodies the definition of a shocking, hard-hitting drama in every sense. 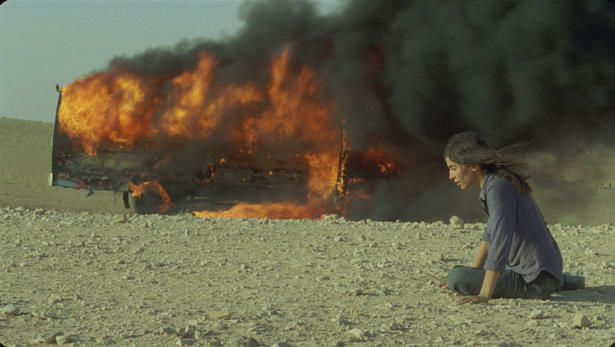 Despite the fact that it is a French-Canadian production, Incendies takes place in a fictional Middle-Eastern country. It follows the story of twins Jeanne (Mélissa Désormeaux-Poulin) and Simon (Maxim Gaudette) Marwan, who have just lost their mother, Nawal (Lubna Azabal) due to a stroke. Their mother wishes that they both try to track down their father, who they thought was dead, and their brother, who they never knew existed. Jeanne is more willing to adhere to her mother's wishes, so she goes on a journey to see that they are met. What she discovers is a family history which is going to much more shocking than she expected, and she asks Simon to join her. The film intercuts between them finding out the truth and Narwal's story, which unfold at the same speed. To say that the plot is multi-layered is a bit of an understatement. We see everything from cruel punishment, to political rebellion, to the disgusting acts that humans can commit. Denis Villeneuve never tries to make you feel alienated by the amount of horrid things that are going on, and it's never like he is trying too hard to grab your attention with all of these different ideas. What he is essentially doing is reminding me that we each live our own lives, and those lives are opened up to a whole lot of things, and anything could happen to one person. Those things could happen to one person, and no-one else would ever know, not even the closest friend or relative. It makes you question how much other people actually know about you, and if they found out more about you whether it would change their perspective of you as a person. The twins certainly were put in an interesting situation when they found out what had happened to their mother and who she really was, which makes this movie even more shocking. The film slowly unfolds and from the very beginning you should be transfixed on the events and trying to piece them together. We are just like the twins, trying to get the facts straight so we can get something that resembles a story that makes sense. In amidst the burning mystery from the plot, the film looks beautiful. It is very simple, but it evokes the strongest of emotions. There are some brilliant shots, just like the frozen expression on Nawal's face after she receives a shock, the fire of the bus in the background with Nawal on the ground in front of it, and when the children are getting recruited into the army. With these shots, Villeneuve is giving the audience sharp jabs to remind us of how horrible everything is. At some points, this film made me feel sick, from just the simplest of shots. This film is everything: terrifying, heart-breaking, truly horrible to watch at times. Villeneuve and his cast do their utmost best to make you feel uncomfortable, but all the while they keep you glued to the screen. Incendies has it's best moment, though, when the twist is revealed. Without any spoilers, I can tell you that it comes as a smack in the teeth. Simon sums it up in a simple riddle, and as Jeanne works out what he is saying she lets out a piercing gasp. This scared the living daylights out of me, but as that fear went away I had to come to terms with what I had just found out. It was an awful feeling trying to process what had happened, but that is what this film does: it makes you feel a combination of emotions instead of just one. It's because of this that Incendies will linger in my mind for perhaps the rest of my life. It takes you on an emotional rollercoaster, to hell and back, to places that neither you or the characters thought you would go. Incendies is the epitome of a cinematic jolt, and it is a jolt which you can't afford to miss. Great review, you summed it up very well. 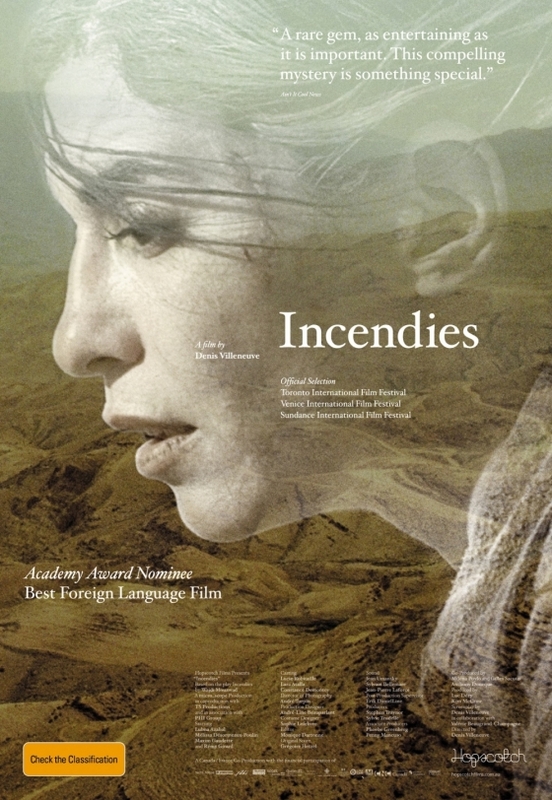 Incendies was also my pick for the Oscar last year, but then again they almost always get it wrong. I was utterly confused when Simon asks Jeanne one plus one equals two right? It can not be one. But then it hit me. Devastating. Brilliant Review of equally brilliant film. Can you explain??? is it a reference to something said earlier in the movie? Well, I saw the movie and I understand everything in it, the plot, the flashbacks, everything. I still don't understand why Simon said one plus one equals one? By posting the question I got the answer! Simon and Jeanne were looking for 1 brother and 1 father, e.g., 2 different people (1 + 1 = 2), but then he realized they were the same person, so 1 + 1 = 1 ! Thanks for nothing to all the people who do not want to communicate and express their ideas and/or share their knowledge. Answering that you should know something is presumtious, lazy, and rude. I really loved Incendies, one of my favorites of 2011. I heard that some very clever film geeks looked through the final twist and saw it coming long before. I didn't though, so to me the relevation was as for you, a smack on the teeth. I watched it this summer but it's still lingering in my mind. I've watched the Danish one as well, and while I think that one is very good too, I'd say I liked Incendies a snap better. It's definitely more memorable. I completely agree with you Stevee! This film shot right up my top 10 of the year list when I finally got a chance to see it!! Incendies is an absolutely stunning cinematic masterpiece. I wouldn't hesitate to rank it as the best movie I've seen so far this decade (well it's only been two years lol). Glad you loved it Stevee, great review! Sati - Haha, that is a good idea! SDG - I admit, it took me a while to figure it out, but when it hit me, my head started hurting, a lot. Thanks! Jessica - I definitely didn't see it coming at all, either! Scott - Same here! Thanks! Great review and pretty much sums up what's been going on in my head right now as I just watched the movie. This very minute. I actually grasped really slow I had to read discussion about this movie just to put together the puzzle (that horror reaction of Jeanne) and unconsciously I, too, had the same gasp as hers when I learned the answer. The last paragraph of your review is just the most precise of what I'm feeling right now. Wheew!